This issue focuses on “NASVA (National Agency for Automotive Safety & Victims’ Aid)", which provides integrated services for preventing car accidents and supporting victims as its main purposes, aiming at realizing a society where people and automobiles can coexist. Among those, we focus on the "Safety Guidance Department" responsible for services such as guidance courses for vehicle operation managers or aptitude diagnosis for drivers, as part of accident prevention activities. Aiming at making the existing stand-alone system with a paper test more efficient and effective, the Department developed "NASVA Net", a driving aptitude diagnostic system that runs on the Internet. It came into service in June this year. It is driving simulation diagnosis using a computer-graphics (CG) simulation that forms the nucleus of the system. It is based on three-dimensional virtual-reality (VR) space, which is created with 3D real-time VR software "UC-win/Road" of the Forum 8. To hear about this, we interviewed Mr. Takahisa Karasudani, Director of NASVA; Mr. Mitsuru Nishio, Manager of Safety Guidance Department who leads spreading and promotion of "NASVA Net"; and Mr. Tomoyuki Fuse, Chief of the Department in charge of developing the system. NASVA was established about five years ago, in October 2003. In Japan, traffic accidents increased rapidly in the period of high economic growth. Following this, a course of action was aroused for the whole country to cope with the countermeasure, including enactment of the Law on Traffic Safety Policy in 1970. As a part of this, the Law concerning National Organization of Automotive Safety and the Injured Party Welfare (ASIW) was enacted, followed by establishment of National Organization of Automotive Safety and the Injured Party Welfare, which is a predecessor of NASVA. After that, under the reform of public corporations, the Law concerning the independent administrative agency National Agency for Automotive Safety & Victims' Aid (law No. 183) was proclaimed in December, 2002. Subsequently, following the establishment of National Agency for Automotive Safety & Victims' Aid subcommittee of Independent Administrative Institution Evaluation Committee in the Ministry of Land, Infrastructure and Transport in July 2003, NASVA was founded at the same time as the National Organization for Automotive Safety and Victims was dissolved in October 2003. The service of the center has been inherited and expanded by NASVA. Embracing "Coexistence of People and Automobiles" as its principle, NASVA positions contribution to building up a secure, safe, and comfortable society through preventing car accidents and supporting victims as its mission. The specific approach can be summarized by three mainstays of "preventing", "supporting", and "protecting". From a viewpoint of preventing accidents, instructive short courses for operation managers and so on, aptitude diagnosis and counseling of drivers, and support for transport safety management have been developed. From a viewpoint of supporting victims, its activities include establishment and operation of medical care facilities, payment of nursing care charge for the handicapped with severe residual disorder, as well as interest-free loan of the fund for orphans from automobile accidents, an association for the orphans, and family counseling. From a viewpoint of protecting, information service is provided through automobile safety test (car assessment) and the hot line for traffic accident victims. Headquartered in Tokyo, the organization consists of nine main branches (Sapporo, Sendai, Niigata, Tokyo, Nagoya, Osaka, Hiroshima, Takamatsu, and Fukuoka), 41 branches nationwide, and 4 rehabilitation centers for the disabled, which are operated on commission. It has 334 staff in all (as of 2008). The "Safety Guidance Department" to be introduced this time takes charge of the service in connection with the accident prevention in NASVA mentioned above. It works for instructive short courses, such as for operation managers to ensure safety of operation of commercial vehicles, such as buses, taxis, and trucks, as well as aptitude diagnosis and counseling for the drivers of transportation business, etc. "The present aptitude diagnosis uses a standalone system set up at each branch. However, it has been required to improve the efficiency (of a series of processes) from such aspects as time and cost." The aptitude diagnosis for drivers is applied for the drivers who operate automobiles used for transportation business, to grasp each person's personality, behavior towards safe driving, cognitive and processing functions, visual ability and so on from both psychological and physical aspects. Based on these results, detailed advice is to be given for safe driving corresponding to each driver's characteristics. Besides, NASVA conducts an aptitude test required for specific professional drivers such as newly appointed drivers, senior drivers, or drivers who are apt to induce accidents, under the approval of MLIT. In the present aptitude diagnosis, a client visits the nearest branch of NASVA. First, a paper test is conducted to see if the client has a specific aspect of personality that tends to lead an accident. Next, through handling of the system set up at the branch, each one's timing of judgment and actions, accuracy of the actions, care distribution, and visual ability are measured. Finally, advice and guidance will be given individually or in a group, with individual results summarized in an aptitude diagnostic sheet delivered back to the client. In this process, there rose a concern that the client learns about the diagnostic test while taking it regularly. There were also increased requirements for cost-effectiveness due to the time loss of gathering at each branch and the problem of incidental expenses, as Mr. Mitsuru Nishio explains. Because of this, they have been shaping a plan of a new system that runs on the internet instead of the existing stand-alone system, as an approach to realize driver aptitude diagnosis more efficiently and effectively, since about 2 years ago. 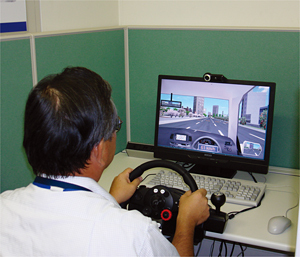 "In developing a new system, we made efforts to create new functions of the aptitude diagnosis to evaluate more specific driving behavior in some way or others," said Mr. Tomoyuki Fuse. The present diagnosis by paper, which asks questions about reactions to various set-up situations to have them answered by the clients, has brought about a certain effect on conducting psychological counseling. However, it lacked mechanism to make a particular diagnosis from the way of manipulation when the client actually drives an automobile. Therefore, it was unable to form a concrete image of the client driving an automobile when advising about accident prevention. This was considered to restrict providing more minute support. In other words, it was considered that by incorporating a function to evaluate driving behaviors, the driver aptitude diagnosis itself should be more persuasive, says Mr. Fuse. As a tool to build up a base for the new system that reflects such needs, "UC-win/Road" drew attention. By using it, 3D spaces including various objects such as roads can be easily created, and more possibilities can be expected if they model specific places where accidents occur frequently on their own in the future. In addition, though VR and CG used to require an expensive workstation, they can be represented on a common PC now. It was assumed to bring about advantages on both the operator's and users' sides of the system. Through the examination stage of the new system plan so far, it was decided to install "UC-win/Road". They started obtaining data to relate with diagnosis since October 2006, along with creation of road spaces for concrete simulation. Since October 2007, diagnostic items were narrowed down, and then the road space which serves as a basis was incorporated into the diagnostic system. Verifying repeatedly and improving accuracy, the internet aptitude diagnostic system "NASVA Net" started its operational service on June 30th, 2008. The Overview of "NASVA Net"
The most characteristic function of "NASVA Net" is "a diagnosis by driving simulation using CG simulation", which covers judgments on safe and ecological driving rate, preventive safety driving rate, hasty driving rate, and thoughtful driving rate. Every movement of the vehicle caused by driving will be recorded, making it possible to provide detailed analysis. Moreover, in consideration of the decrease of visual ability by aging, it was expanded to include measurement of additional visual functions such as kinetic vision (horizontal direction), movement of the eyeball, and peripheral vision. Furthermore, measuring and diagnostic functions, such as fatigue accumulation rate, SAS (sleep apnea syndrome) related matter, and the corporate environment for safety were added. Diagnosis for susceptibility to danger and the aptitude diagnostic sheet were also improved. 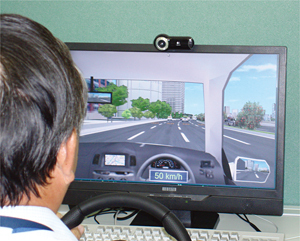 The advantages of introducing the new system include 1) time and business trip cost can be saved because it is available 24 hours a day, 365 days a year via the internet, 2) driving characteristics can be more concretely recognized through the newly developed driving simulation diagnosis, 3) usability in combination with guidance of safe and ecological driving, 4) safety management information can be viewed, and 5) PR effect of the corporation. While throwing its energy to spread the system among freight companies, NASVA is planning to replace the existing system set up at their 50 branches nationwide with "NASVA Net" within 3 years. "In future, we would like to diversify 3D spaces by reflecting more familiar road conditions, make measurement items of the aptitude diagnosis that use these 3D spaces more advanced and accurate, and explore to improve the effect of accident prevention through them." Beyond the development of the "NASVA Net" this time, Mr. Tomoyuki Fuse expects the possibility of utilizing it as a tool for safety management, which is another target of NASVA. With the aid of "NASVA Net" system, support will be more efficient, making NASVA able to concentrate its energy on its core service of improving security and safety, which NASVA should aim to do as its original goals. Mr. Mitsuru Nishio regards that it is this safety management that they finally aim at in fact. Based on this, as he continues, expansion of total accident-prevention consulting including "NASVA Net" is considered in their vision.